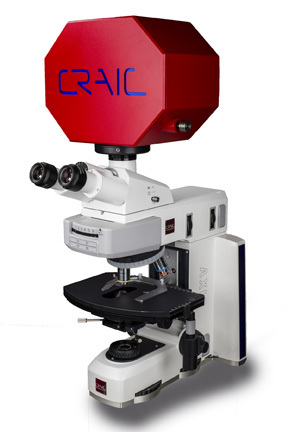 CRAIC Technologies, Inc. is a global technology leader focused on innovations for microscopy and microspectroscopy in the ultraviolet, visible and near-infrared. The company manufactures quality instruments that offer high-speed precision metrology for the forensic science, biotechnology, semiconductor, geology, nanotechnology and materials science communities. CRAIC Technologies cutting-edge solutions are exemplified by the video and instruments below. The 20/30 Microspectrophotometer series incorporates the latest technological advances in optics, spectroscopy and software to deliver the best performance in a microspectrophotometer to date. Yet it retains the ease-of-use for which CRAIC instruments are known and represents a further step forward in UV-visible-NIR microspectroscopy. UV-Vis-NIR spectra in one shot... No changing optics! The 20/30 Microspectrophotometer incorporates many of the latest technologies. Touch screen controls, sophisticated software, calibrated variable apertures and other innovations all point to a new level of sophistication in microanalysis. Measurements across the UV-visible-NIR range in transmission, absorbance, reflectance, luminescence, and fluorescence are possible on sub-micron samples to those well over a 100 µm across. And while microspectra are being acquired, the sample may be simultaneously viewed in the deep UV and NIR with the high-resolution digital imaging system or in the visible through the research grade eyepiece optics. Images and time-resolved spectral data are acquired and recorded in one rapid seamless operation from across the instrument's extended spectral range. The 20/30 Microspectrophotometer is simple to use, the measurements are non-destructive, and the quality of the spectral data is unmatched. The 20/30 is more than just a scientific instrument, it is the solution to your analytical challenges. FLEX™ from CRAIC is a full-featured yet flexibly configured instrument that incorporates UV-visible-NIR optics, spectrophotometers, digital imaging, and software...all tied together with the Lightswitch by CRAIC™ optical multiplexer. The FLEX™ microspectrophotometer utilises tested technologies to allow you to measure UV-visible-NIR range transmission, absorbance, reflectance, emission and fluorescence spectra of microscopic sample areas. Simultaneous imaging via a high-resolution colour digital camera system or eyepieces is standard, while additional features can include measuring the refractive index of microscopic samples as well as microcolorimetry and microspot thin film thickness measurements. The new CRAIC Elixir™ is the smart solution for the accurate and rapid analysis of trace evidence. For the first time, forensic scientists can conduct microspectroscopy, high-resolution imaging, microspectroscopy and glass refractive index measurement using one, easy-to-use tool. For accurate and rapid analysis of trace evidence, nothing comes close to the cost effective, multi-functional CRAIC Elixir™. The CRAIC Elixir™ solution integrates an advanced spectrophotometer with an optical microscope and powerful yet easy-to-use software. This enables the forensic scientist to quickly analyse all manner of microscopic samples of trace evidence using high-sensitivity multiple analytical techniques. The CRAIC Elixir™ is more than just a scientific instrument... it's the smart solution to the forensic challenges faced by law enforcement today. The 308 PV™ enables you to collect transmission, reflectance, polarisation or even fluorescence spectra of microscopic samples. Depending upon the microscope optics and sources, the spectral range is from the deep UV to the near infrared region. With the 308 PV™, high quality spectra of even sub-micron samples can be acquired non-destructively and with ease. The 308 PV™ is an effective means to upgrade a microscope to the latest hardware and software microspectrophotometer. The 508 PV™ UV-visible-NIR spectrophotometer is designed to be added to an open photoport of a microscope or probe station for non-destructive analysis of the spectra of many types of microscopic samples. The 508 PV™ features the cutting edge Lightblades™ spectrophotometers from CRAIC Technologies. These can acquire spectra of microscopic sample areas by absorbance, reflectance, polarisation, luminescence and fluorescence, in addition to high-resolution colour images, when attached to properly configured microscopes via the proprietary optical interface. The 508 PV™ is an effective means to upgrade a microscope to the latest hardware and software microspectrophotometer. The CRAIC MP-2™ Microscope Photometer is designed to add photometry and imaging to an optical microscope. With a spectral range from the deep UV to the near infrared, the MP-2™ is better described as a microscope radiometer. It is limited only by the microscope's optics. The CRAIC MP-2™ microphotometer enables collection of transmission, reflectance or even fluorescence and luminescence photometric data of microscopic samples. The solid state detectors have dynamic ranges and sensitivities greater than PMTs or imaging systems and with complete software control, either broad- or narrow-band, photometric intensity measurements can be made. The MP-2™ is a cost-effective method for upgrading a microscope.